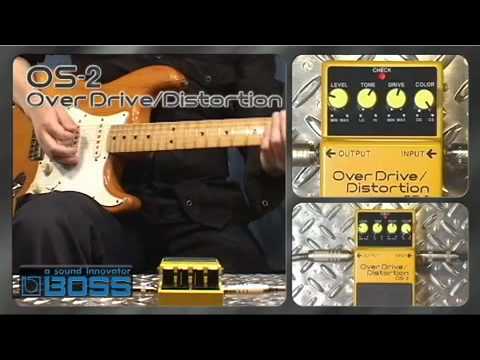 The Boss OS-2 Overdrive/Distortion Pedal gives you a choice of overdrive or distortion or lets you combine both - all in a single compact pedal. This integration gives you more options rather than using serially connected units, and provides hard distortion that maintains the subtle nuances of single-coil guitar pickups. The OS-2 is happy to be push, whether it's a subtle little nudge towards a little sizzle, right up to a hair-raising brittle wail. Everything from warm, blended overdrive right through to over-the-top extreme lead distortion sounds can be produced with ease thanks to the clear control system. So whether you're performing smooth blues' inspired licks with graceful elegance, or putting the fear into people with your frenetic soloing, the OS-2 gives you the opportunity to find your sound with ease. Level, tone, drive and colour give you all the parameters you need to create fierce tone to suit your performance. Sculpt and shape the signal as little or as much as you like to get your perfect tone. The footswitch is equipped with a very useful LED light that lets you know if your battery is getting low when not using an AC adapter; as well as letting you know when it is/isn't in operation. As with all Boss pedals, the OS-2 is constructed using a rugged metal case and rubber footplate so that no matter how hard you stomp on it, you are guaranteed incredible durability. To back this up, Boss have included a 5-year warranty. Posted on 31/01/2016 by Jim Try playing something like Garry Moore's Still got the blues trough this. If you play rock or blues then you need this pedal, go have a demo.